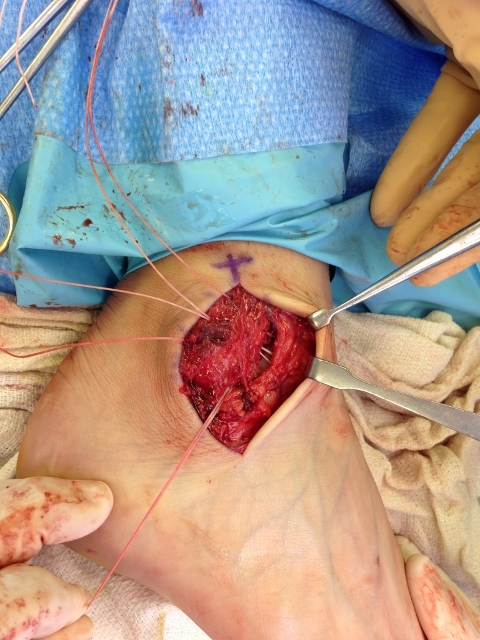 The following are intra-operative clinical pictures of a lateral ankle stabilization with sutures used to recreate the previously injured and malfunctioning lateral ankle ligaments. The intact calcaneal fibular ligament is seen (top right). Final repaired lateral soft issue structures which will support the lateral ankle and stablize the ankle (image bottom right). 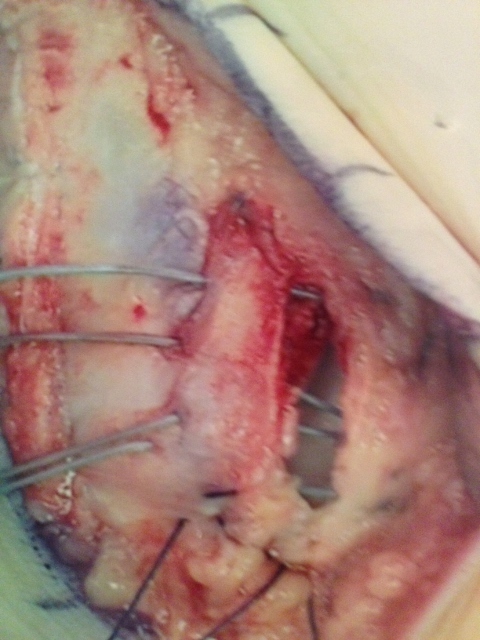 Another case in which very strong suture is being used to re-inforce the lateral ankle ligaments that have been acutely injured and did not heal appropriately or repetitive injuries to the ligaments leading to ligament laxity. Final repaired lateral soft issue structures which will support the lateral ankle and stablize the ankle (image far right). The important lateral ligamentous structures include the anterior talofibular ligament (ATFL), posterior talofibular ligament (PTFL), and calcaneofibular ligament (CFL). The ATFL runs from the anterior edge of the lateral malleolus to the talar neck, attaching just anterior to the lateral malleolar facet. It is the most important lateral stabilizer of the ankle, being the primary restraint to supination and anterior translation; it also limits plantarflexion and internal rotation. The PTFL courses from the posterior talus to the back of the lateral malleolus. 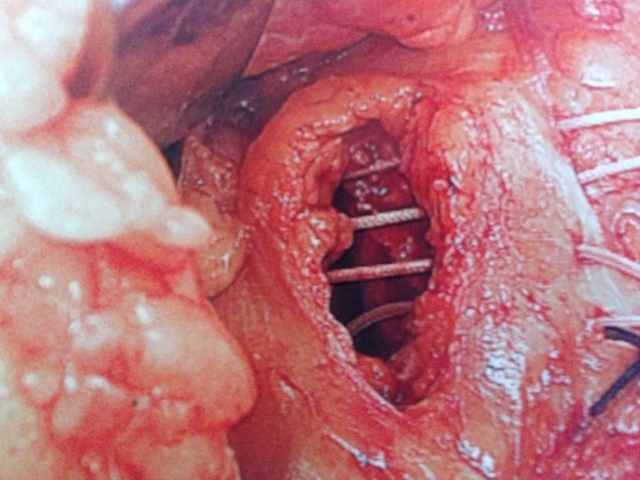 It is located deep and is the strongest of the lateral ligament complex. The calcaneofibular ligament (CFL) lies deep to the peroneal tendon sheath, originating from the tip of the fibula to the lateral tubercle of the calcaneous. The hallmarks of chronic ankle instability include repeated ankle sprains that have led to an altered patient activity level. Important factors include injuries sustained, frequency of events, localization of pain, and prior treatment modalities. The degree of disability appreciated by the patient is one of the most important factors and can be significant in both high and low-demand individuals. The initial patient evaluation starts with an assessment of standing hindfoot alignment. The contralateral ankle should be evaluated for range of motion, strength, ankle drawer and associated forefoot and hindfoot abnormalities. This gives the examiner an appreciation for the patient’s baseline exam. The exam is then repeated in the same manner on the pathologic side, noting the discrepancies between sides. Additionally, particular attention should be paid to peroneal strength, subluxation/dislocation, or pain. The inversion test evaluates the integrity of the CFL. This is performed by first dorsiflexing the ankle to neutral and then inverting the hindfoot. Increased laxity is highly specific for CFL injury. The anterior drawer test is performed with one hand stabilizing the tibia and the contralateral hand cupping the heel and pulling forward. If the ATFL is disrupted the talus will translate anteriorly and with a more subtle internal rotation because of the intact medial structures. Other contributing factors such as hindfoot varus, plantarflexion of the first ray, and midfoot cavus should be evaluated. 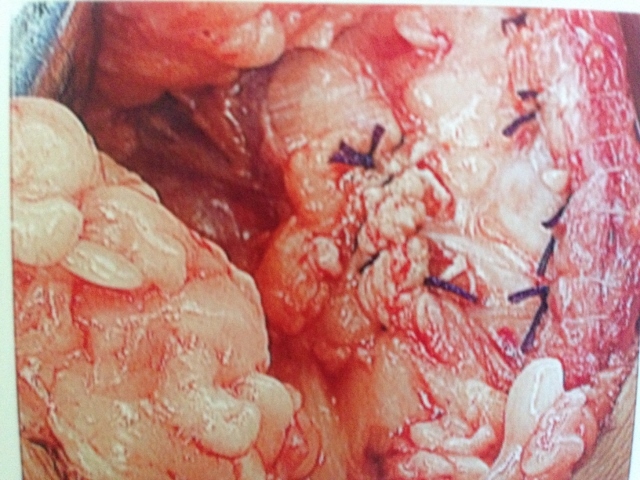 Intraop pic during lateral stabilization. 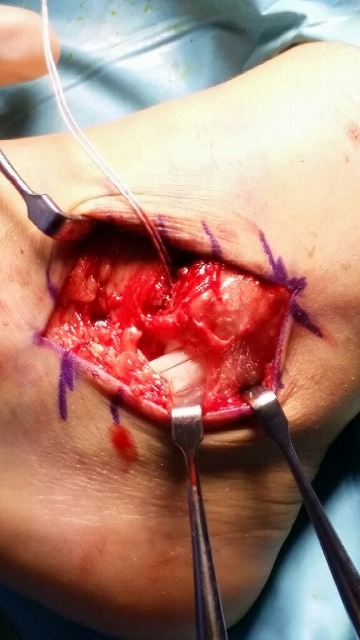 The sutures are being passed through the repair and fibula. 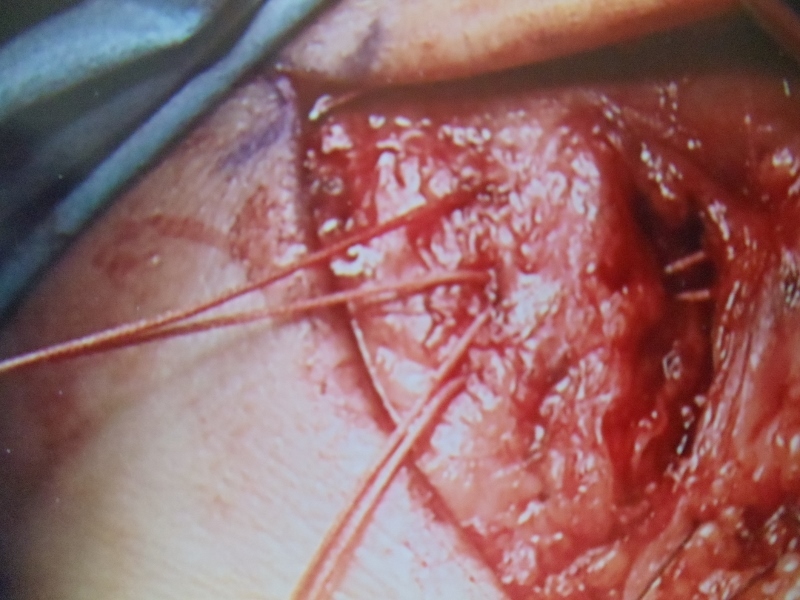 Pic during and immediately postop of lateral stabilization. 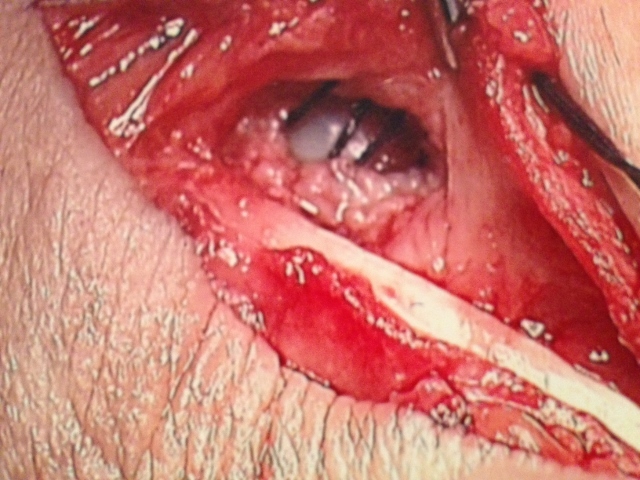 Pics of lateral stabilization to repair torn ATFL. 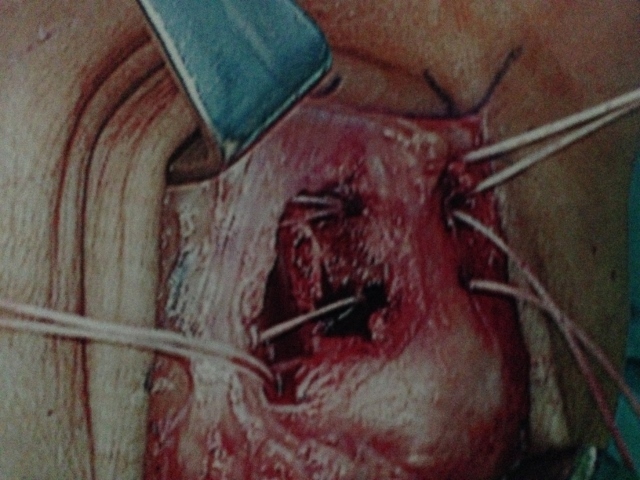 Picture of lateral stabilization surgery in which the ATFL is reattached to the fibula through drill holes and suture. 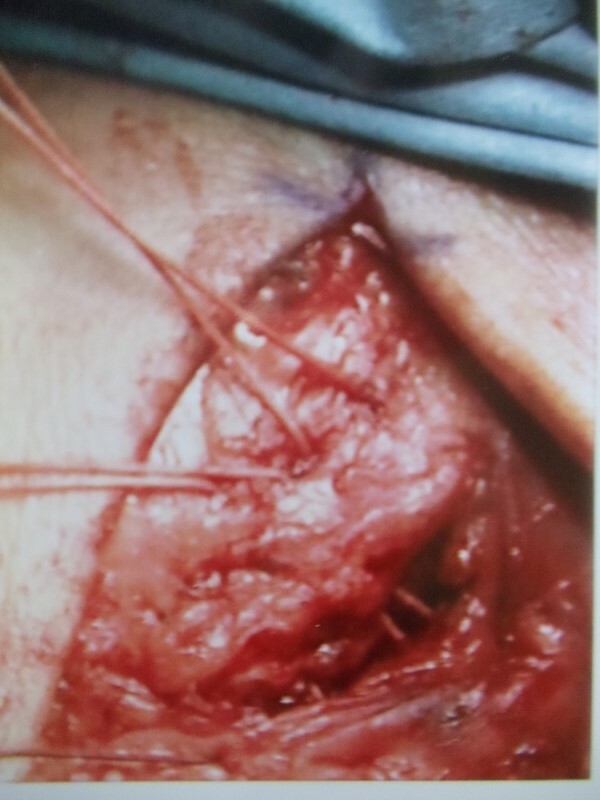 Repair of CFL ligament and passing of suture to stabilize. After identifying the tear in the ATFL, we debride the fibula to bleeding bone to allow scarring of the ligament to the bone. 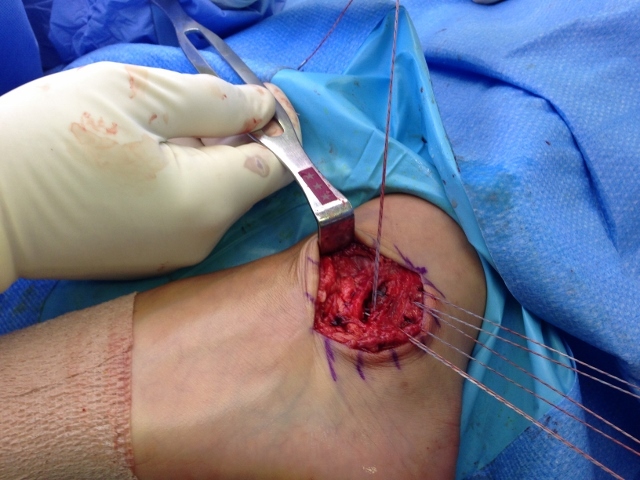 We pull the sutured ligament through drill holes in the fibula and tie them behind it to stabilize the lateral ankle. 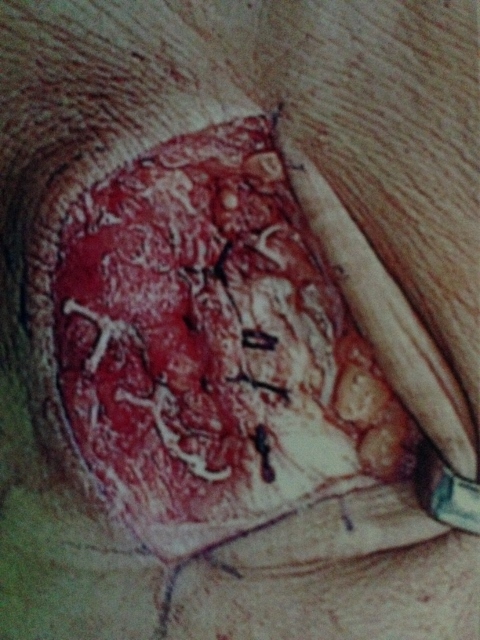 The CFL is identified to beneath the peroneals to the left of the incision. 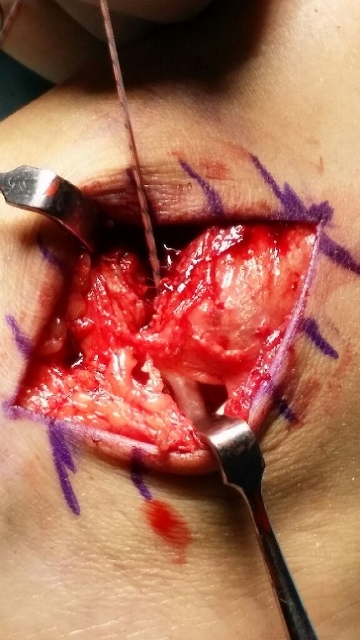 After Closure of the ligament and capsule of the lateral ankle.